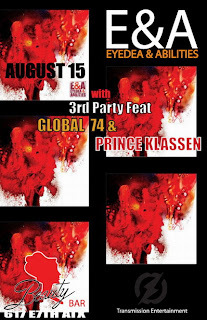 From the poo poo platter department... Eyedea & Abilities @ Beauty Bar on Aug 15th with 3rd Party, Global 74 and Prince Klassen. I have been pwned by the spicy beef soup at Korea Grill in the new Chinatown. Started immediately after lunch yesterday, continued through the night, then had to leave work early! This is now the new poo poo platter! Eyedea & Abilities is an American rap duo. Eyedea (real name: Micheal Larsen) who also performs under the name Oliver Hart and with freestyle group Face Candy, became widely known because of his battle and freestyle skills. Eyedea is best known for his victory at the Blaze Battle, which was aired on HBO, showing some of the best underground battlers in action. Eyedea originally toured with Slug and other Rhymesayers crew. He made the jump from a battle emcee with the release of his first album First Born by joining forces with DJ Abilities. DJ Abilities is known for winning three DMC awards and for his work on his mixtapes and 1200 Hobos. Following a solo effort by Eyedea in 2002 under the name Oliver Hart, Eyedea and Abilities released E&A in 2004, which returned Eyedea back to his battle rapper roots. After Eyedea released "This Is Where We Were" with his live freestyle/jazz group Face Candy, he created Carbon Carousel, an alternative rock band. They have released one EP titled "The Some of All Things or: The Healing Power of Scab Picking". This brought on speculation that Eyedea & Abilities was no longer together. However, in August 2007, the duo announced on their Myspace that they would be at the Twin Cities Celebration of Hip Hop performing old songs, as well as new material.